Marty Stewart's lead guitarist 'Brad Davis' teaches 11 classic Tony Rice solos! 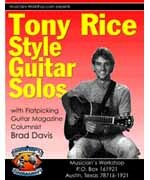 In this course Brad teaches 12 solos in the style of Tony Rice. These are not note-for-note copies from recorded versions, but are true to the style. Most of the tunes presented appear on Tony's 'Church Street Blues' and 'Cold on the Shoulder' LPs. Tunes include: Cold on the Shoulder, Banks Of The Ohio, Wayfaring Stranger, Big Spiked Hammer, John Hardy, Church Street Blues, Streets of London, One More Night, Goldrush, Cattle In The Cane, Orphan Annie. 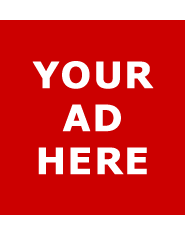 (CD & Tablature) *Brad Davis is a featured monthly columnist for 'Flatpicking Guitar Magazine' -------------------------------------------------------------------------------- About Brad Davis Brad Davis has many years of experience as an acclaimed bluegrass and country music guitarist. With several albums to his credit, Brad's most widely heard guitar work is on Marty Stuart's gold record 'This Ones Gonna Hurt You.' Brad debuted his patented 'Brad Bender,' the string bender for acoustic guitars, and the unique style it offers, on countless national television shows with the Sweethearts of the Rodeo. In addition to currently touring with Marty Stuart, Brad also spent several years on the road with the Forester Sisters. Songwriting, record production, and the production of instructional material for the guitar are also wedged into his tight schedule. Brad's experience with providing quality instructional material began when he authored several popular courses for Musician' Workshop. Brad's up and coming projects include an instrumental cassette of eight original tunes called 'Climbing Cole Hill,' and a Bluegrass CD titled 'Raising Cain' with his band 'Whitewater.' In addition to playing lead electric and acoustic guitar on the road with Marty Stuart for the past ten years, Brad has also played on Marty's gold selling album 'This Ones Gonna Hurt You,' Marty Stuart 'Hit Pack,' and Marty's latest MCA recording 'The Pilgrim. Brad played on the soundtrack of Steven Seagal's 'Fire Down Below,' and performed music for Billy Bob Thornton's upcoming Miramax releases 'Daddy And Them' and 'Waking Up In Reno.' Brad also recorded two new album projects featuring Billy Bob Thornton on Mercury Nashville due for release this year. Additionally, Brad has worked for, or recorded with, Willie Nelson, EmmyLou Harris, Pam Tillis, The Forester Sisters, The Sweethearts of the Rodeo, and currently tours with Marty Stuart, Billy Bob Thornton, and banjo legend Earl Scruggs as the lead guitar player for the band Earl Scruggs & Friends. Norman demonstrates guitar techniques, musical ideas, playing style in this complete two DVD set.